Metallic back worship dress features boat neck, metallic front insert, peasant sleeves with thick metallic gold trim, invisible zipper, inverted triangle metallic gold back insert, waist seam, and a full body circle skirt for graceful movement. 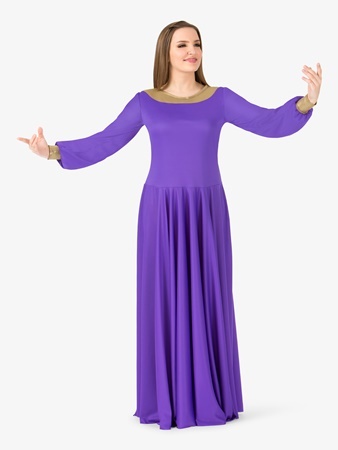 This Bal togs liturgical piece was designed with long length and polyester fabric allowing hemlines to be cut at any desired length without fray. WAIST 22"-24" 24"-26" 26"-28" 29"-30" 30"-32"
INSEAM 28"-29" 29"-30" 30"-31" 31"-32" 33"-34"